The Suburban Woman's Club of Pompton Plains will sponsor its 23rd Annual Holiday House Tour on Sunday, Dec. 5 from noon till 4 p.m. Tickets are $20 tickets and available at Pequannock Township Public Library, 477 Newark Pompton Turnpike, Pompton Plains; Fireside Furniture, 695 Route 23 South, Pompton Plains; Hometown Market, 574 Newark Pompton Turnpike, Pompton Plains. For more information contact Ginny 973-835-4114. The Hightstown Woman's Club is sponsoring a Christmas Candlelight House Tour on Sunday, December 11, 2011 from 3 -6 p.m. Seven private homes will be on tour. Advance sale tickets are $10 and can be purchased by calling 609-448-8388. Day of event tickets are $15 and sold at Ely House, 164 North Main Street, Hightstown, N.J. 08520. Refreshments and Holiday Boutique will also be at Ely House after 2 p.m. on Sunday, December 11, 2011. Boatsie's Boxes a Success Again! Boatsie's Boxes, for the 3rd year in a row was a great success! The Federation gathered the forces of its 193 clubs and 9,200 members throughout the state to support "Boatsie's Boxes Operation Christmas Stocking" project by purchasing and filling 1,543 Christmas stockings, including $3200 in cash donations for U.S. soldiers serving in Iraq and Afghanistan. The stockings brimming with goodies will be delivered to Wheeling, WV, where Boatsie's Boxes is headquartered. The Clubwomen who make up the New Jersey State Federation of Women’s Clubs (NJSFWC) of GFWC again showed how they can make a difference by providing community service through participation in local clubs, enabling members to make a difference in live of others one project at a time. for more information and how you can donate to a great cause! The deadline for submitting a candidate for Women of Achievement is fast approaching. By December 15th all nominations are due to Headquarters. Surely every club member knows of a woman either in her club or in her town who has made a mark in the community. Perhaps you have read of a woman whom you don’t know personally, but you feel has impacted the community or state. The woman could be a Doctor, Dentist, Educator, a community leader or your next door neighbor. Consider submitting her name along with supporting material that could make her one of the five honorees at the Annual Convention on Monday evening May 7th, 2012. FYI: Non NJSFWC Clubwomen can also nominate a woman for this award! For questions or further information, please contact WOA Chairman, Marilyn Marion at m.marion@live.com or NJSFWC Education Chairman, Vivien Finn at vfinn@njsfwc.org. Day of Service a Success! Today was Make A Difference Day and clubwomen from 200 clubs accross the state donated assorted items to the 3 Veteran's homes located in New Jersey! The items in the photo went to the Menlo Park location. 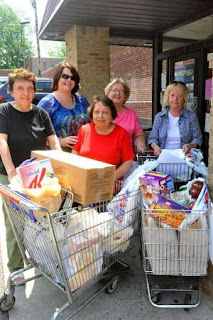 Pictured are Clubwomen from 10 clubs in the Highlands District who gathered at the Roxbury Senior Citizen building to collect items from the 25 clubs in the District. We filled 3 vans alone with items such as sweatshirts, sweatpants, socks, hats and toiletry items. Nominations are now being accepted for the 31st Annual Women of Achievement Awards. Sponsored by the New Jersey State Federation of Women’s Club (NJSFWC) of GFWC and Douglas Residential College of Rutgers, The State University, the awards were created to recognize outstanding women in various fields throughout New Jersey. Previous winners of this award include: Senator Jennifer Beck, Mary Higgins Clark, Christine Todd Whitman and Althea Gibson. To be eligible for this honor, each nominee must be a woman who has gained visibility in New Jersey for her contributions, including professional/personal accomplishments, activities and achievements. The deadline for submitting an application is December 15, 2011. Winners will be honored at the awards ceremony, to be held at the 118th NJSFWC Annual Convention, at the Trump Plaza Hotel in Atlantic City on Monday, May 7th, 2012. Applications can be found on the NJSFWC website, www.njsfwc.org or by calling (732) 249-5474. Join 300 New Jersey Clubwomen who will be attending the New Jersey State Federation of Women’s Clubs of GFWC State Fall Conference which is being held on Monday, October 17th at the Bridgewater Marriott, 70 Commons Way, Bridgewater. NJSFWC President Patty Whitehouse of Gladstone will preside at the event, which will begin at 10:00 am. • A variety of workshops, including one on Cyberbullying, presented by Suzanne Kowalski and Nicole Duccca of the Middlesex County Prosecutors Office Training Center’s M.O.R.E. • A “Marketplace” which will allow the members to pick up materials and speak with the respective focus area chairmen regarding new community service project ideas. The focus areas include, but are not limited to, the arts, conservation, education, international outreach and public issues. • Vendors will be offering an assortment of items offered for sale, just in time for early holiday shopping. The keynote speaker for the afternoon session will be Phyllis Adams, Executive Director of Women Aware, Inc. who will present, “The Many Faces of Domestic Violence”. Thirty years ago, Women Award was founded on the belief that every human being has the right to live free from violence and the fear of violence. Women Aware is open 24 hours per day, 365 days per year. A hotline and an emergency shelter, as well as a full spectrum of ancillary support services, are available. The General Federation of Women’s Clubs of GFWC’s Signature Project is Domestic Violence Awareness and Prevention. October is National Domestic Violence Awareness Month. The conference is open to members and non-members. The price of the Conference is $40.00. Additional information and a registration form can be found on the NJSFWC website, njsfwc.org or by calling (732) 249-5474. The Veterans’ Homes of New Jersey will be the focus of this administration’s Day of Service project on Saturday, October 22nd. There are three veterans’ homes in New Jersey: Menlo Park, Paramus and Vineland. These Veterans’ homes are open to the service men and women from the Air Force, Army, Coast Guard, Marines and Navy. The first residents were veterans from the War of 1812, the Civil War and the Spanish American War, followed by World War I and World War II. The next generation of admissions’ included the Korean War and the Vietnam War. The services of these facilities will continue to serve the needs of veterans from the Gulf, Iraq and Afghanistan Wars. Pictured to your right with some of the 420 watches that were donated to the American Mural Project are, from left NJSFWC Arts Creative Chairman Gloria Sammis, from Hamburg, artist Ellen Griesedieck and NJSFWC 2nd Vice President, Jill Passaretti, from Vernon. Thirty-one New Jersey State Federation of Women’s Club (NJSFWC) of GFWC members recently visited the American Mural Project in Winsted CT, one of the GFWC International’s Partnership Program projects for the Arts. GWFC Connecticut graciously hosted the day, providing NJSFWC members an opportunity to meet the American Mural Project artist, Ellen Griesedieck, and hear her personal story. Members were able to tour and imagine the changes that will be taking place in the two former mill buildings. The mural is expected to be the largest indoor collaborative artwork in the world –120 feet long, five stories high, and up to ten feet deep as a tribute to working Americans. These watches along with thousands of others will honor GFWC members’ hours of volunteerism. They will be encased in resin and intertwined together to form a huge watch link running throughout the three dimensional mural. The 2011 GFWC Middle Atlantic Region (MAR) Conference will be one of rededication to preserve our past, marked by a trip on Thursday, September 15th to Evergreen Cemetery in Lakewood, New Jersey to rededicate the gravesite of GFWC Founder, Jane Cunningham Croly and look toward our future as New Jersey Girls welcome us to a fun-filled weekend. The Home Life Department of the Riverdale Woman's Club made and delivered 87 mastectomy pillows to the Chilton Hospital’s Comprehensive Breast Center in Pequannock. This is a yearly project that the women undertake as a way of giving back to the community. The Riverdale Woman's Club is always ready to welcome new members. For membership information call 973-835-3269. 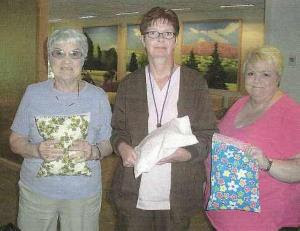 Pictured from left to right are: club member Vilma Waclawski, Lynn Case of Chilton, and club member Josephine Spenillo. Woman’s Club Evening Membership Department on their successful food drive! The most recent drive was held June 18 and was utilized by local families and single adults. For just this one day, they collected four car loads of bagged groceries and collected more than $200 worth of donations. Member Claire Hill said the volunteer organization decided to become involved in food drives due to the high rate of unemployment and the increased home expenses in the area. Many clubs support their local food pantries and social service agencies with in kind and monetary donations. The 120th GFWC International Convention will be held June 18-20 in Milwaukee, Wi. See link below for additional information. A welcome orientation and reception will be held on June 17th. Join clubwomen from all over the USA and abroad for Workshops, Banquets,speakers and Lunch & Learn sessions. In all 50 states and more than a dozen countries, our members work locally to create global change. GFWC clubwomen are mothers, sisters, wives, daughters, doctors, teachers, and community leaders who are dedicated to enhancing the lives of others through volunteer service. NJSFWC State Convention A Success! The 117th Annual New Jersey State Federation of Women’s Clubs (NJSFWC) of the General Federation of Women’s Clubs (GFWC’s) convention was held recently at the Trump Plaza Hotel and Casino in Atlantic City. The convention was presided over by State President Patty Whitehouse of Gladstone. A variety of business sessions, workshops, exhibits, awards and entertainment was enjoyed by more than 500 clubwomen, representing 111 clubs in New Jersey. Support Girls' Career Institute (GCI) and purchase a raffle ticket! This beautiful quilt is being raffled to benefit GCI! Tickets are $5.00 for 1 raffle and 3 tickets for $10.00. Call Carol Sas at NJSFWC Headquarters at (732) 249-5474 for tickets. GFWC Middle Atlantic Region Conference, Hyatt REgency Hotel, New Brunswick. The quilt was made by Judith Baymiller and donated by Barbara Hall, Pine Lake Woman's Club, Inc.
For girls completing their junior year in High School. Girl’s Career Institute is designed to give them a taste of college living. Women speakers give the attendees information on various careers that may interested them. (1/29/2011) Women are invited to attend NJSFWC Public Issues Day, honoring women in the military. For over 100 years the New Jersey State Federation of Women’s Clubs of GFWC (NJSFWC) has sponsored a Public Issues Day. Over the years, members have been briefed on a variety of legislative concerns impacting women and their families. This year’s event will be held on March 21 at the Crowne Plaza Hotel in Monroe Township with over 200 women in attendance from Federated clubs from across the state. Judith Ambrus of Bridgewater, NJSFWC Public Issues chairman, announced that the theme of the day will be "Honoring Women in the Military." Clubwomen who have served in various capacities in the military will be honored. If you know a woman that you would like to be honored at this event, please contact the NJSFWC President Patty Whitehouse at pwhitehouse@njsfwc.org or NJSFWC Public Issues Chairman Judith Ambrus at jambrus@njsfwc.org. There will be a variety of speakers, including representatives from the Women in Military Service for American Memorial Foundation, the USO and the Veteran’s Administration. In addition, members of the New Jersey legislature have also been invited to share with the attendees what New Jersey is doing to support the military and veterans. NJSFWC President Patty Whitehouse, of Gladstone, has announced that the General Federation of Women’s Clubs (GFWC) International President Carlene A. Garner will also be in attendance. This exciting event will begin at 10 a.m. The price of the Conference is $39.50. Additional information and a registration form can be found on the NJSFWC website, www.njsfwc.org, or by calling (732) 249-5474. (1/17/11) The Margaret Yardley Fellowship Fund was established in 1930 to provide fellowship grants to deserving women who are New Jersey residents pursuing post-graduate advanced studies at the school of their choice. The first contribution to the fund in 1930 was $5,000 given by Farnham Yardley in memory of his mother, the first NJSFWC President Margaret Yardley. NJSFWC has been able to award between six and eight $1,000 fellowship grants to deserving women annually. Considerations used when judging applicants’ qualifications include scholastic achievement, career service potential and charitable endeavors. The grant is applied solely to tuition expenses. If you know of a young woman who is eligible for this grant, applications are available. The deadline for all information must be received by the committee at NJSFWC Headquarters by March 1. The application can found be on the njsfwc.org website, listed under "Projects" or call NJSFWC Headquarters for more information. (1/04/2011) Now that January is here, it is time for all NJSFWC districts to hold their January Mid-Year Council. All eight districts hold their own meeting through the month of January. Feel free to click on the link below and see when a meeting is being held in your area. We have clubs in all parts of New Jersey and we would love to see some new faces. For those of you clubwomen who have not been to a district meeting, they are a great way to find out a little more of what the NJSFWC is all about and to meet some other clubwomen in your area.